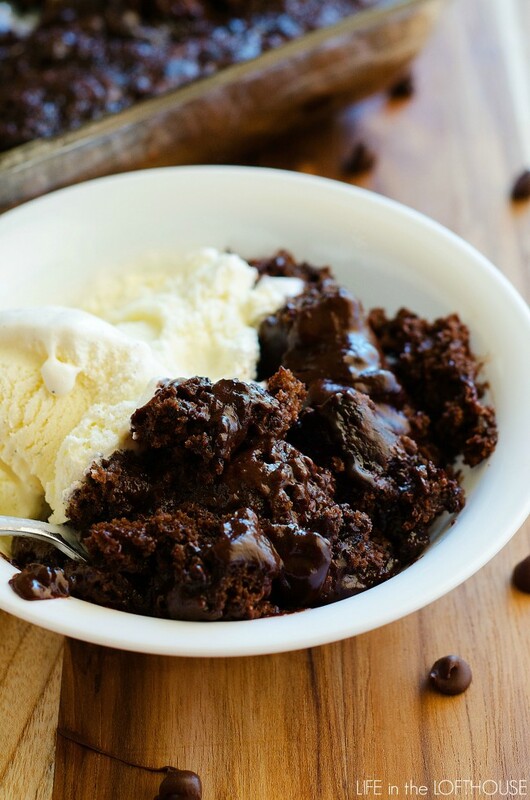 Hot Fudge Pudding Cake is a simple homemade cake batter that bakes into a beautiful chocolate cake. 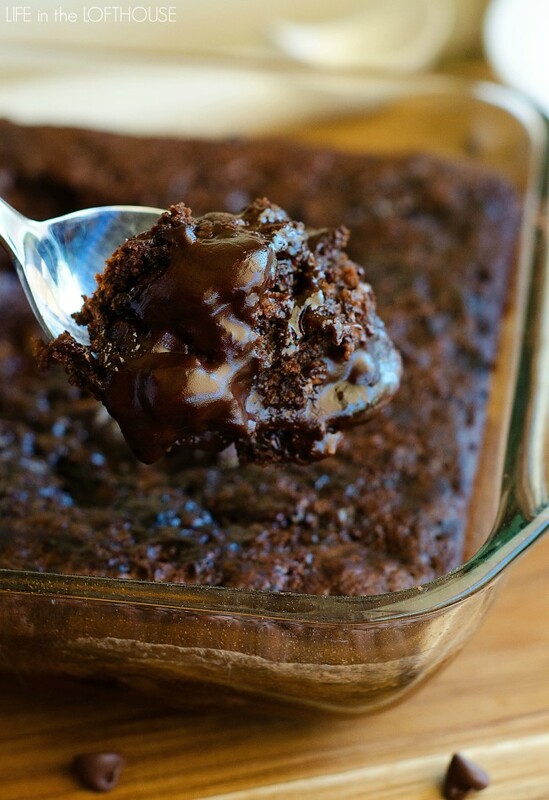 Warm fudge is hidden inside resulting in a gooey delicious center! I don’t even know where to begin with this heavenly cake. 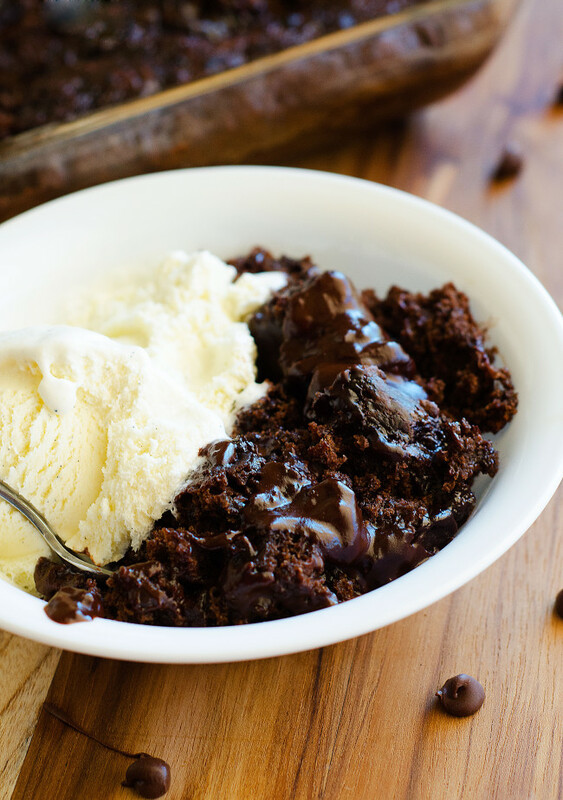 How do I explain how insanely delicious and AMAZING this Hot Fudge Pudding Cake is? 😉 I’m really hoping the pictures speak for themselves, but just in case they don’t I’ll try and fill you in. 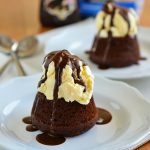 Hot Fudge Pudding Cake is a super simple homemade cake batter that bakes into a beautiful chocolate cake with warm fudge hidden inside. 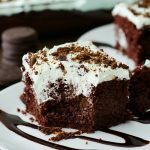 The chocolate flavor is spot-on and the combo of cake with creamy fudge is perfection. It’s basically a dream-come-true dessert. Yes! It can easily be doubled. The recipe I’m sharing is for an 8×8-inch size baking pan. If you would like to double it use a 9×13-inch pan and double the ingredients. Easy peasy! Those are the two main questions I get. Please feel free to leave me a comment if you have any other questions. 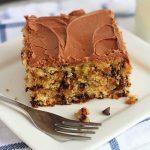 This cake is incredibly easy to make and will be the star of dessert. I promise! This looks like heaven! How would it hold up making it the night before? 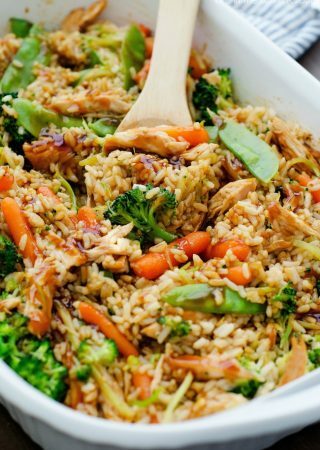 Would love to make this for coworkers but I don’t have a stove at work to serve right away. Hi! I recently made this, left it in the pan, covered it with foil to refrigerate overnight and the fudge was not soaked up! 🙂 I reheated it in the microwave for 1min and it still oozed with chocolate goodness! Thanks so much for this recipe! Awesome Sofie!! So glad it worked out. We just LOVE this cake! Could this be doubled for a 9 x 13 pan? 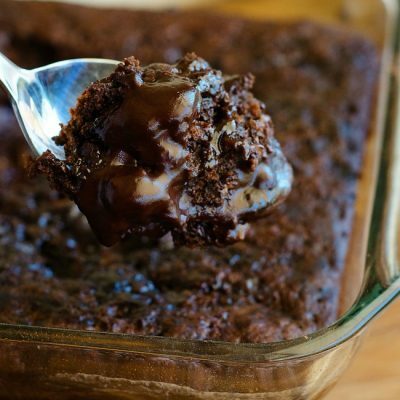 I just made this recipe because I was craving chocolate, and it is AMAZING! I absolutely loved it! I thought all of the chocolate sauce dried up during cooking, but then I took a scoop out of the cake and fudge oozed out. Seriously, it is the best chocolate cake ever. This looks amazing ! Did you use powdered sugar? I’ve gone through so many recipes, but this one is not only delicious, but crazy easy. So many Pinterest desserts are too sweet (even with a sweet tooth), but this one is perfect. Thanks for sharing!! This was delicious! Mine was a little bit less fudgy than in your picture but still tasted really good Might be because I used coconut oil instead of butter, not sure. Anyhow, will still do it again. Hi, I was just wondering, if I make half the recipe how long should I bake it?? Thank you so much!! 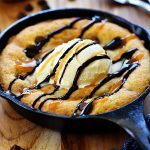 Hi..it looks absolutely awsome..but i didn’t get the last part..do i pour the water after the batter is in the pan? Been searching for this recipe for ever. Made it once when our son was small, he loved it but it was awhile since I made it, could not find the recipe and could not remember it. I’ll surprise him with it one day soon. I am thrilled to see this recipe. My grandmother made this for us when she would visit our home. It was a recipe she had in her head, my mom always said she knew how to make it , but never did. So it wasn’t written down and saved. I don’t remember Chocolate chips, but sounds right to me. I can’t wait to make this for my grandkids ! Do I use unsweetened or sweetened cocoa?! Thanks so much! I just made it! It is so good easy to make! 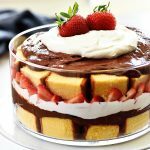 Can this be made using a boxed cake mix? Making this tonight! Looks amazing! THANK YOU So much for this recipe. I used to make this as a child with my Mother over 55 years ago. It was the very first cake I learned to bake. 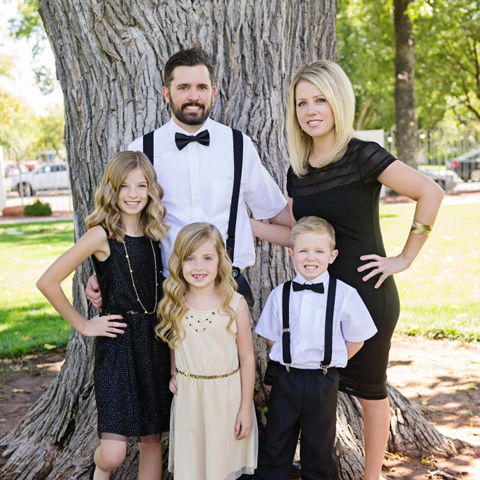 I loved making it for my family, especially for my Dad. Sadly, I lost the recipe over the years and have been looking for it. THIS IS IT.. We called it Mud Pie. Can’t wait to teach my grandchildren to make it. – Now if only my Children would get busy on that “recipe”. Hi! I planned on making this awesome cake today for the first time but realized I don’t have an 8 x 8 pan. Would any other size work? Thanks!! You could use a 9×9 as well, anything bigger and the cake will be too flat and won’t work. My old (and yummy) recipe uses brown sugar instead of granulated with the cocoa in the topping. Your food photography is amazing! 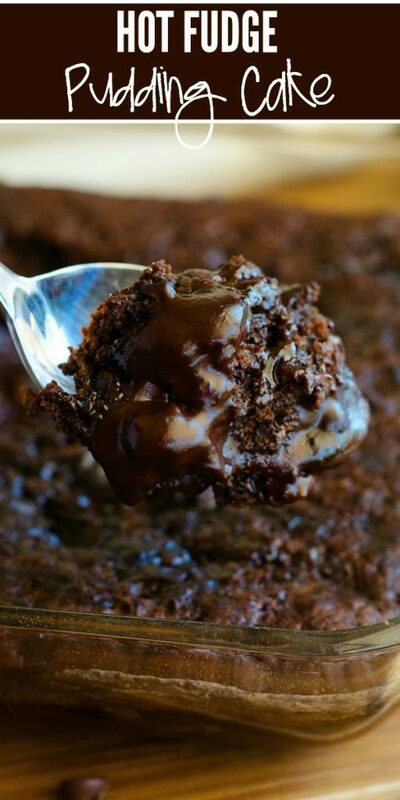 These brownies look beyond delicious! 😀 Thank you so much for sharing. I am striving to become a hand lettering blogger, and I am looking for a good Pinterest plugin that has the awesome hover “pin it” option that you have. Could you tell me what plugin you are using for this function? I definitely pinned your images too! Absolutely delicious, my family loved it with Kelly’s Clotted Cream Icecream. It will now be a regular favourite in our house, thank you for posting. This was a family favorite growing up! The second time I made this I used Hershey’s. Special Dark 100% cacao powder. It was great, gave such a deep chocolate flavor. This is my grandsons favorite cake now. Not only is your recipe incredibly easy but it also tastes absolutely amazing and is so rich. I’ll definitely be checking out other recipes on your site. I made this exactly as per the instructions and it was a bit flat in my dish. If I want to make a bigger batch, do I just double all the ingredients? Or is there another method. I would just double everything and use a 9×13 inch baking dish!